I have in the past summoned the theories of those such as Georg Lukacs in my critique of certain films. I have complained when movies take detours into absolutely meaningless subplots which detract from the pacing and progress of a movie. Indeed, I have been criticized at times for neglecting the "spectacle" that film so uniquely offers. While I stand by those earlier reviews, I am writing now in celebration of the exact opposite. Call me a hypocrite, but Spielberg's infamous flop, 1941, succeeds precisely because it is nothing but spectacle; sheer, irreverent spectacle. Why does this succeed (for me) where others have failed? Well for one, 1941 never claims to be anything but spectacle. It makes this clear to the audience, beginning with an explicit parody of Spielberg's first hit JAWS (same actress and everything!). It's followed up by not-so-subtle references to DR. STRANGELOVE, THE GRADUATE, and plenty more. Once you figure out the rules to watching this movie, it becomes an enjoyable "game" to play. As the audience, all you must do is accept the fact that this is Hollywood's best doing Hollywood's worst: in other words, high camp. 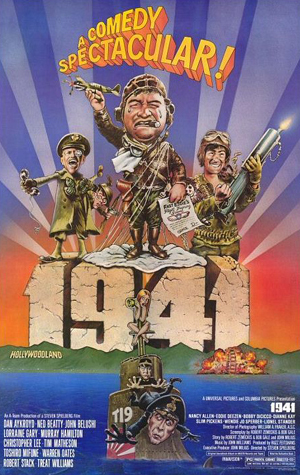 Fair warning: 1941 makes clear that comedy does not equal camp, nor vice versa. Many of the scenes go by with less than a couple laughs, but always constant is Spielberg's undeniable mastery of the visually engaging. Everything from zooming airplanes to ferris wheels occupy the eye. This isn't the same kind of film as, say, AIRPLANE. That film was all about the sight gag. 1941 is simply about the visual spectacle (something which the claustrophobia of AIRPLANE never comes close to delivering). The grandness of Spielberg's visual feast is arguably what also keeps it from being a nuanced comedy. There are too many characters and set pieces to allow the kind of emotional comedy that develops in a tighter film. There are some occasional hilarious one liners (such as when a bunch of American schoolboys test out their anti-Japanese tiger trap on their older sister and then react to her indignation with a trite "Ya dug yer own grave.") There are also some peculiarly amusing sight gags (such as "ninja" trained Japanese submarines men making their way across the California countryside disguised as Christmas trees only to be foiled by an axe wielding woodsman just doing his job). 1941 is quantity not quality, it's noise not nuance. Since JAWS, Spielberg has become Hollywood. In 1941 he makes clear that he is indeed self-aware of the phenomenon of his own making. 1941's a movie, a camp movie, a dumb movie, but it's a gorgeous movie that makes Spielberg's skill behind the camera emblematic, since, well, that's really all there is… And that's okay by me.